best upgrade path for an e6850? apparently my cousin wasn't sure what cpu he had. it's actually an i7-965 3.2ghz so now i am going to get a new board + ram. ram - mushkin 998677B Blackline DDR3 1333 (PC3 10666) 7-7-7-20 @ 1.5-1.6v (here is where i'm a bit confused, do i want/need DDR3 1600 ? i do plan to overclock, hopefully reach ~4ghz. thermal compound - cooler comes with arctic cooling mx-2, is that fine or should i go back to ac5 or ceramique? don't really want to buy an ssd until the prices come down. is it a no brainer to go to an i7 930? with an x58 board? is it worth upgrading now? or just stick with what i have for awhile longer? diff in newer games like bad company 2.
or is there another chip/platform i should be considering? If you are happy with your current rig, I would wait see the new stuff coming from Intel and AMD starting later this year. seeing how your an overclocker... grab an i7. If you need more power, later when the 970 falls in price, grab that for a hexcore. I dont really like asus anymore. Ive had too many failures from them. Im more partial to giggy this time around, and eVGA. Although eVGA is foxconn. To be honest, an i7 930 should do 3.6 realtively easy if you have a decient sink. And YMMV on 4ghz even. @ that speeds, yes it is night and day. And if you scale gpu cards, that day only gets brighter. ICH10 is about the best you can get onboard for SSD's even, and thats the SB on the X58. If you dont mind spending a little extra, E5620 is the 32nm version, has a better memory controller, and gives you 12megs of cache, and will work inside some regular X58 boards. The QX6800 is a nice processor which comes unlocked and is a piece of cake to overclock, just make sure that you don't spend a lot of money to buy it and get a nice air cooling device. 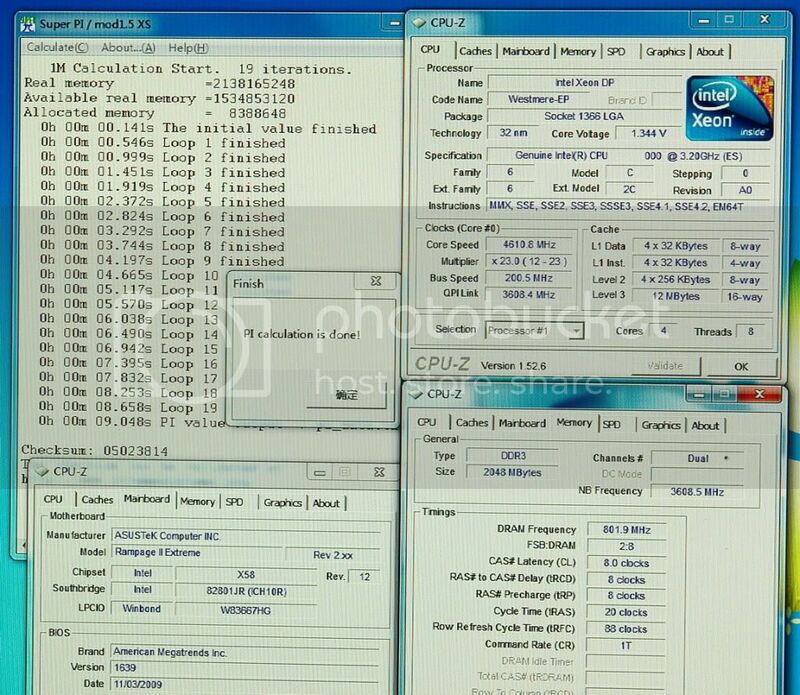 The QX6800 at stock should be as fast as a Core 2 Quad Q9450 or a 2.30GHz Core i5 equivalent or Phenom II X4 920.
ip35 is not a great board for quadcores. its not a durable board either. i don't really want to buy another board as i'm looking at this as a "cheap" upgrade. i haven't had any issues so far, but then again im only on a dual. what issues arise when putting a quad in there besides heat? i have an almost identical set up as you do. since i only play at 1680x and with my ati 5770 all my games run fine, though i don't use AA/AF. i'm happy with my performance and i'm going to wait until the next generation of quad/hex intel chips and possibly new sockets. the issue with our IP-35's is a pretty bad vdroop which makes it not friendly to quads and trying to overclock. in addition, there are some socket 775 quads that won't work at all on our board, though i don't remember their exact name. I'd sell that off and get a socket AM3+. you can ungrade all the way to a 6core. I would say it's not worth upgrading your platform and getting a $200 processor + $130 mobo + $100 ram (Unless you can sell off your parts for a decent amount). Otherwise, i would rather consider selling the processor only and getting a used Q9550 for example. edited first post, apparently my cousin wasn't sure what cpu he had. Question Next CPU/Platform Upgrade Timing? Question CPU upgrade or no? Question Whats your CPU upgrade history? Performance improvements gaps between upgrades? Question Will upgrading my CPU help?